Glass capacitors are used where the ultimate performance is required for RF circuits. Glass dielectric capacitors offer very high levels of performance, although their cost is high when compared to many other forms of the capacitor. Typically a glass capacitor will have a relatively low capacitance value. The values of glass capacitors may range from a fraction of a picofarad up to two to here thousand picofarads. As such these capacitors are used mainly in radio frequency circuit design. While the performance of glass capacitors is exceedingly high, this is also usually reflected in the cost – it can run into many pounds or dollars for each component. As such glass dielectric capacitors are reserved only for the most exacting RF requirements, often on low volume products where cost is not such an issues as it is in high volume products. The supply of glass capacitors is also limited to a small number of manufacturers and suppliers, and the capacitors may not be available ex-stock. Low-temperature coefficient: Glass capacitors have a low-temperature coefficient. Figures of just over 100 ppm / C are often obtained for these capacitors. No hysteresis: Some forms of capacitor exhibit hysteresis in their temperature characteristic. This is not the case for glass capacitors which follow the same temperature/capacitance when the temperature is rising and falling. Zero aging rate: Many electronics components change their value with age as chemical reactions take place within the component. 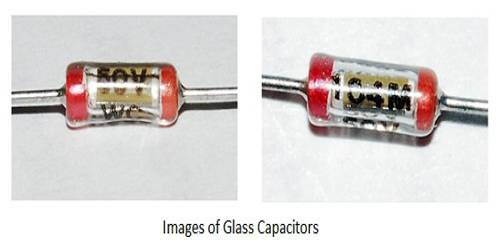 Glass capacitors do not exhibit this effect and retain their original value over long periods of time. No piezo-electric noise: Some capacitors exhibit the piezo-electric effect to a small degree. This can result in effects such as microphone on oscillators. Where this could be a problem, the use of glass capacitors could help solve the problem. Extremely low loss / High Q: Glass capacitors are a very low loss as there is virtually no dielectric loss. This enables very high Q circuits to be built using them. provided the other components (e.g. inductors) are not lossy. Large RF current capability: Some capacitors are not able to withstand large values of current. This is not the case for glass capacitors which are suitable for use in RF high power amplifiers, etc. High operating temperature capability: Glass dielectric capacitors are able to operate at very high temperatures. Many are able to operate at temperatures up to about 200C without fear of damage or performance shortfall.